Thyroid hormones are essential for the normal metabolic functioning of all tissues in the body, and a wide array of symptoms are therefore associated with abnormalities in thyroid hormone production and activation. Even when apparently adequate amounts of thyroxine are produced by the thyroid gland, thyroid function is profoundly affected by anything that disrupts conversion of thyroxine (T4) to the active thyroid hormone, triiodothyronine (T3). This conversion takes place primarily at the cellular level within tissues; only 20% of circulating T3 is generated by conversion of T4 within the thyroid gland itself. 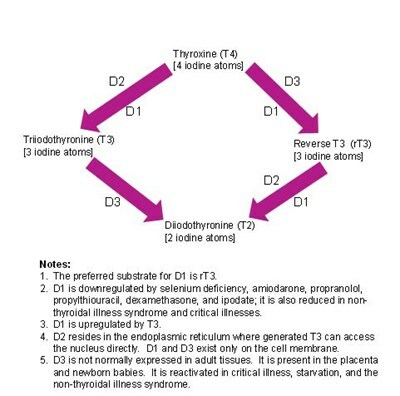 Both circulating and intracellular thyroid hormone levels are controlled by a complex, highly regulated system involving three iodothyronine deiodinases (known as D1, D2, and D3), which selectively remove iodine atoms to create the different hormones (see diagram). This system not only controls the relative amounts of both active and inactive hormone in the cell, but it also has the effect of conserving iodine, which has multiple intracellular functions (in the thyroid gland, the iodine is recycled for the synthesis of more thyroxine). A full discussion of the deiodinases and how they act as gatekeepers to intracellular thyroid hormone bioavailability and control the metabolic rate is outside the scope of this blog, but it is important to refer to high quality, recent reviews in peer-reviewed journals to understand this system properly [e.g., 1, 2, 3, 4]. What affects circulating levels of rT3 and T3? Much experimental research into the deiodinase systems in various tissues has necessarily been done in animals other than humans, and when studying the research on reverse T3 (rT3) it is important to remember that humans are not the same as rodents. Bear in mind, for example, that hepatic D1 activity is the major contributor to circulating T3 in the rat, while in humans it is the D2 enzyme present in peripheral tissues that contributes the bulk of circulating T3. Various disease states, and some drugs, alter the expression of each of the deiodinases, and thereby change the relative concentrations of circulating hormones. In normal adults, rT3 circulates at roughly 40 times the level of free T3 (reference range in normal adults for rT3 is about 9-25 ng/dL, while for free T3 it is 2.5-6.5 pg/mL, i.e., 0.25-0.65 ng/dL). The relative levels of rT3 and T3 are affected by factors that stimulate or inhibit the activities of the deiodinases, as described below. Reverse T3 (3,3’,5’-triiodothyronine, rT3) is a biologically inactive metabolite of thyroxine (T4) formed by selective deiodination; the active thyroid hormone T3 is formed by removal of an iodine atom in the outer ring of T4, while rT3 is formed by removal of an iodine atom in the inner ring of T4. Relative amounts of each are determined by the activity of the respective deiodinase enzymes, which are regulated by hormonal and nutritional factors and physiological conditions. In humans, the D1 enzyme has a much higher substrate preference for rT3 than for T4 , suggesting that its main function is to deiodinate rT3 to form T2, both conserving iodine and clearing rT3. In conditions in which D1 is downregulated, an increase in circulating rT3 is seen because the conversion of rT3 to T2 is significantly reduced, resulting in an accumulation of rT3. D1 is downregulated by selenium deficiency and in the non-thyroidal illness syndrome, as well as some cancers. It is also inhibited by some drugs, notably amiodarone, propranolol, propylthiouracil, dexamethasone, and ipodate. On the other hand, D1 is upregulated by T3, which restores the clearance of rT3 (via conversion to T2) and reduces the levels of circulating rT3 relative to T3. T3 therapy has therefore been used in some studies of critically ill patients in an attempt to restore intracellular thyroid function by upregulating the D1 deiodinase, but in general such treatment has not affected prognosis and it remains controversial. Most studies find that successful treatment of the underlying illness, as well as maintaining nutritional support and re-introducing mobility as soon as possible, naturally restores the T3/rT3 ratio to normal. Unlike D1 and D3 which are located in the plasma membrane of cells, D2 resides in the endoplasmic reticulum inside the cytosolic compartment, where the T3 generated by its activity can directly enter the nucleus and interact with thyroid receptors. The activity of D2 is therefore a primary determinant of intracellular T3 availability and thyroid receptor occupancy. While T3 generated from the activity of D1 is known to equilibrate rapidly with the plasma, D2-generated T3 remains within the cell and takes several hours to equilibrate with plasma. Unlike D1, D2 activity is increased in non-thyroidal illness. The D3 enzyme is not normally expressed in adult tissues, whereas it is present in the placenta and the neonate where it protects the developing organism from excess thyroid hormone activity. It is, however, reactivated in conditions associated with a reduced metabolic rate, particularly starvation, severe carbohydrate restriction, tissue injury, reduced tissue oxygen supply, and critical illness (or the non-thyroidal illness syndrome), and also in chronic inflammation and some cancers. Its activity is increased in hyperthyroidism and decreased in hypothyroidism in the rat. D3 serves to inactivate T4 by converting it to rT3; this therefore limits the amount of T4 that can be used to form T3, reducing the availability of T3 to the thyroid receptors and thus slowing the metabolic rate. rT3 is rapidly cleared from the circulation, or further deiodinated to T2, which is now thought to exert some important biological effects at the thyroid receptors, albeit at about 100-fold reduced potency compared to T3 [5,6]. Want to learn about the role of reverse T3 in Thyroid Assessment? Read Part II in the follow up blog post.